The rise of eCommerce has affected the logistics of all consumer goods, including heavy goods such as furniture. Unlike businesses shipping small parcels, heavy goods shippers have had to face a new challenge: how to ship their large products, nationwide, in a cost-effective way. The logistics for furniture retailers has also evolved in response to eCommerce’s ascendance. Vendors used to ship a truckload of furniture to brick and mortar retailers and let the retailer manage their local deliveries, but now more and more retailers are shrinking their in-house delivery capacity and electing to use drop-ship programs provided by the vendor. This allows them to not only avoid stocking up on any inventory, but to pass all the headaches associated with shipping heavy goods to the vendor. Pure eCommerce furniture eTailers have further shifted the shipping burden to vendors and driven the search for end-to-end shipping solutions, since they have no logistics capabilities, not even a physical presence, and limited expertise. The end-to-end solutions offered by heavyweights like UPS and FedEx are not up to the task of shipping furniture, since unlike in a standard parcel delivery, the logistics provider has to deal with heavy and, in most cases, bulky pieces, which need special handling for a successful delivery. This changing landscape has resulted in a paradigm shift in heavy goods shipping: a progression towards LTL (less-than-truckload) and threshold deliveries, where a non-furniture-specific trucking company will drop the furniture in its original box outside the customer’s home. This process foregoes any inspection prior to delivery that would ensure the product is in adequate condition. The delivery team has the customer sign a proof of delivery and moves on to their next stop, leaving the customer to figure it all out by themselves. And then…BOOM, something is wrong with the order! A piece is missing, the product is damaged or, not infrequently, the customer actually damages the product themselves in their efforts to assemble the product. At this point, the customer is angry; they decide to return the product by either asking for a replacement or cancelling the order entirely. The nightmare has begun – whatever projections you made about the shipping cost of this order can be thrown out the window. This where data can play a big role. At Deliveright Labs we comb through massive amounts of delivery data to produce valuable insights into what drives delivery failures. These findings are then implemented into our last-mile delivery platform, Grasshopper. We have analyzed some major, and vexing, factors that add to a shipper’s delivery budget. We decided to share our findings so our customers can learn how to optimize their shipping decisions and reduce their overall cost. We focused on the hidden underlying costs, most of which are not straightforward to calculate. For each cost, we have assigned a % of the original shipping cost to help you see how impactful each cost can be. Customer service (3%-5% cost of delivery): When a delivery fails, the customer will contact the furniture seller’s customer service team to explore their options. The resolution process can take much time and back and forth between the shipper, the delivery team, and the customer in order to figure out what exactly happened. This added call volume can force the shipper to hire additional customer service reps to handle post-delivery issues. At Deliveright, we calculated that the number of inbound calls stemming from delivery issues is 50%-70% lower for an order shipping through Deliveright as compared with other carriers. This is due to the use of automated communication modules such as RoboCalls and a function that allows customers to schedule their own deliveries, along with our automated post-delivery resolution center which preemptively reaches out to the customer should an issue arise. Compensation (50%-70%) – Many retailers offer compensation to customers for failed deliveries, so that they will accept the issue and leave the product in their home, precluding any additional shipping costs. This compensation can range from $50 to hundreds of dollars in certain egregious cases. Redelivery cost (50%-70%) – In cases where you have to redeliver a product due to defects, missing pieces, or a missed delivery appointment, the overall shipping cost on the order will jump by at least 50% with the first redelivery. In some cases, redelivery can cost a lot more if it requires repair, repackaging or special handling (hoist, walkups). Return logistics cost (100%-150%) – When a customer cancels their order and decides to return it, the real troubles begin. You, as the shipper, will have to coordinate with your shipping company to pick up the order and ship it back to the vendor. These return logistics transactions are some of the most expensive transactions for any retailer, so much so that many retailers prefer to let the customer just keep the product rather than returning it (case in point: this well-known Wayfair ‘hack’). On top of all this, many items are no longer in a condition to be resold after traveling back and forth, so they will sit in your warehouse and accumulate dust. A return order can turn a profitable transaction into an absolute loser. We would advise giving the customer a large credit or refund rather than picking the piece up. Reputation (?%) – One of the most important yet hardest to quantify costs is the reputational damage that a failed delivery can have on an eTailer. All it takes is one frustrated customer to wreak havoc on your reputation all over the internet. It is impossible to determine how much business can be lost from a bad review, particularly if the review is the first thing a potential customer sees when going to purchase your product. Cashflow (5%-10%) – Many businesses operate such that they only collect the proceeds from a sale after the delivery has been completed. By delaying collection, failed deliveries can have a direct and clear impact on your bottom line. Faster, smoother deliveries can translate to a much better cashflow. Vendor claim (10%-15%) – When a product is deemed damaged, eTailers will start the claims process. As the number of claims rises due to the fact that your deliveries are threshold and are not inspected beforehand, you will need to hire an employee to process these claims. In addition, not all claims will be honored by the vendors, which forces the shipper to absorb any losses on the product. Taking it all in, one can clearly see that the the upfront shipping cost of a cheap, threshold delivery doesn’t tell the entire story, since it doesn’t include the numerous back-end costs of deliveries failing. By upgrading from a threshold to a White Glove delivery, where your product is inspected and touched up (if needed) before delivery, and the product is assembled and installed in the customer’s home, you are likely to save thousands of dollars down the road in exchange for a small upfront cost. At Deliveright, we encourage our customers to upgrade to a White Glove delivery. We see it as if they are buying an insurance policy against the manifold costs of a failed delivery. Having serviced hundreds of thousands of deliveries for our customers, we can confirm that the White Glove option, in particular for furniture, mitigates all of the above costs. Over time, as our customers and others learn to analyze and probabilistically factor in all of the potential costs of a botched delivery, and not just the initial delivery quote, we believe the industry will shift from threshold to embracing White Glove delivery service. You can use our coverage map to see the extent of our service, and use our instant quote tool to price your deliveries! We can also do your pickups in Texas in any area that we cover, for delivery to either Texas or anywhere on the East Coast (West Coast coming soon). It’s easy to get started – just do what you already do! we already cover for you. Just in time for the winter season, let Deliveright make your customers happy everywhere in the states of New York and Pennsylvania. That’s right – whether you are shipping to Niagara Falls or Pittsburgh, Buffalo or Erie, you can have your furniture delivered with Deliveright. Almost 100,000 square miles of territory – that’s a lot of final miles! How do you get started? No sweat! Use your new, beautifully-designed, Grasshopper account to book your next delivery! The exact same process as if you’re shipping to other Northeastern states, the Southeast, California, Illinois… or anywhere else we cover. Happily, your Deliveright coverage will expand even further very, very soon. Stay tuned for more exciting news from us! We have very exciting news for fans of “Da Bears”! Deliveright is now servicing the Chicago metropolitan area, including parts of Indiana and Wisconsin. Starting now, book an order to Chicagoland, just like any other area we cover. To see if we service a specific zip code, just enter it in our quote tool and get a response instantly. No one is happy when a White Glove delivery isn’t completed successfully. Thankfully, as technology and delivery operations improve, these imperfect deliveries are becoming increasingly rare. But they still take up a disproportionate amount of the delivery company and customers’ time. Here’s the good news: there are simple things that customers can do to lower the chance of a delivery being unsuccessful. 1. Confirm that the address and phone number provided to the delivery company are correct. There’s no simpler, yet more avoidable, reason for an order to go wrong than the delivery team having the wrong contact information. 2. Make sure the room is ready before the delivery team arrives. Leaving items in the way adds unnecessary time, stress, and complication to the delivery. 3. Measure the doors in your home to ensure that the furniture will fit. Not just the entrance door to your home, but any door that the furniture will pass through. You do not want to have to remove the legs of your brand new couch just to fit it into your living room! 4. Similarly, always measure the dimensions of your room, and area, of choice to confirm that the furniture will fit in your desired location. 5. If you live in an apartment building, you should communicate the building’s requirements to the delivery company beforehand, including any time restrictions and COI specifications. 6. If the delivery is to be carried up stairs, tell the delivery team how many flights so they can be prepared. Even if you have an elevator, you should let the team know many flights up the room of choice is in case the items do not fit in the elevator, or the elevator is not working. 7. Include at least two phone numbers in your contact information, in case the first number can’t be reached. 8. Confirm that the delivery company is delivering exactly what you ordered – if you ordered a mauve loveseat, check that the manufacturer did not send a purple loveseat! 9. Make sure that you clear your schedule and are available to accept the delivery at the provided date and time. Most companies have a busy schedule, and won’t be able to wait at your home for you to accept delivery if you are not already there. 10. Finally, when the team is at your home, let them do their thing! This is what they do – trust that they will deliver your order with care and attention. Contact at us at feedback@deliveright.com if you have any other tips and tricks! You have asked and we have listened! This update announces two new services which will improve the speed and quality of your delivery service: Deliveright Express and Inspection Upon Arrival. Deliveright Express provides expedited delivery service: from the vendor’s dock to the customer’s home in 5 business days or less! The customer will experience all of the benefits of our White Glove service, just faster! The program will initially be regionally-limited, picking up from vendors in central NC and delivering to the NY metro area, but we will expand it to other locations as soon as possible. Deliveright Express allows you to promise and deliver to your customer in the way you’ve always wanted. It’s perfect for those rush orders where a piece needs to be in the home in time for a critical event. We hope you will take advantage of this exciting opportunity! The second service we are rolling out is Inspection Upon Arrival. This new feature allows you to flag orders (or items within an order) which are particularly sensitive or require extra attention. Items marked for Inspection Upon Arrival will be opened and inspected the moment they arrive at our final mile hubs. Normally, we keep items in the manufacturer’s packaging for as long as possible, because open merchandise is more vulnerable to damage or dust buildup, but some items make sense to inspect right away (marble and glass pieces, for example). Keep in mind: all of our White Glove deliveries are opened, inspected and deluxed before delivery – it’s part of the Deliveright difference – but if an order is marked for Inspection Upon Arrival, it will be inspected twice: the first time upon arrival and again, prior to delivery. We can’t wait to hear your thoughts on these services – contact us at feedback@deliveright.com if you have any thoughts about Deliveright Express, Inspection Upon Arrival, or any other services we offer, (or if you have any ideas for other ways we can improve the Deliveright experience). Stay tuned for much more from us in the coming months! 6 months ago, Tesla’s Elon Musk unveiled the world’s first electric, self-driving truck. This reopened a discussion about how self-driving technology will impact the trucking industry. Some commentators predict a disruption of the trucking labor market, as technology supplants the need for drivers, while others paint a rosier picture, forecasting growth in labor demand in the logistics industry. Today, we are going to take a look at how these innovations will affect White Glove delivery and the last-mile. Although we at Deliveright focus mostly on the last-mile of the heavy goods supply chain, the supply chain has many links besides the last-mile. Typically, heavy goods are shipped from the manufacturer’s plant via a long haul freight carrier to a last-mile hub near the end consumer’s home. From here, a last-mile delivery team will perform the White Glove delivery. Each of these links in the supply chain is subject to automation to varying degrees. So far, self-driving technology is heavily focused on the long haul portion of this journey. The biggest player in this field right now is Uber, through its Advanced Technologies Group (ATG). Uber is developing technology that allows trucks to operate without a human driver over long stretches of highway. These trucks use lidar systems, machines that emit lasers in order to gather data about the trucks’ surroundings. While self-driving trucks are running in Arizona, and one has even delivered 2,000 cases of Budweiser beer within Colorado, the technology is not yet sophisticated enough for a truck to reliably navigate the open roads without a human in the cab, ready to take the wheel at any moment. Uber has started running self-driving trucks in Arizona. The technology is also not yet able to deal with the stresses of driving on small rural roads or in cities. While self-driving cars can already zip through some of America’s most densely-packed urban areas, trucks have to grapple with a greater set of limitations, stemming from their weight and size. “Many avoidance algorithms for self-driving cars just don’t apply to trucks,” says Eric Berdinis, a product manager at Uber working in its self-driving truck division. A number of start-ups have developed prototypes for automating parcel delivery to homes, including Amazon with its now infamous plan to deliver packages by flying drones to customers’ home. But no company has devised a way to automate home delivery of heavy goods. A 2016 McKinsey study identified three developments that are poised to reshape last-mile delivery in the coming years: autonomous ground vehicles with parcel lockers, drones, and bike couriers. None of these solutions address White Glove. Delivery of large items to a consumer’s home still require at least two people to carry and assemble the products. San Francisco start-up Dispatch is one of the many working on automating parcel delivery. Above is their autonomous package cart, Carry. There have been recent baby steps forward in automating the assembly aspect of White Glove deliveries. Last week, after three years of work, a team from a Singapore university programmed a robot to assemble an IKEA chair in 20 minutes. While this is a sign of progress, there remain many hurdles to bringing this technology to consumers, including expense, transportation of the technology to the customer’s home, the complexity of most White Glove deliveries, not to mention the loss of the personal touch of having an attentive, personable delivery team in your home. Given this, it will likely be a very long time before robots are entering our homes to assemble heavy goods. If ever. While many observers have intuited that self-driving technology will be bad for people working in the delivery and logistics businesses, a recent study by Uber ATG contends that the opposite is true. Because this technology will lower shipping costs, it could actually increase demand for goods shipped via trucks. And as the demand for goods increases, so too will the demand for long haul truckers to accompany the self-driving trucks on their interstate journeys. The demand for delivery teams handling the last-mile will especially increase, as this is an area that automation has not yet touched. This could lead to a shift in driver employment from undesirable long haul jobs, where drivers are away from their homes for up to 200 days a year, to last-mile jobs, where drivers can be home for dinner every night. Automation could lead to a shift from long haul jobs to local jobs. Source: Uber ATG Study. Last month, Uber rolled out its Uber Freight operation in Arizona. In the Uber Freight model, a long haul driver pilots a self-driving truck to what Uber calls a “transfer hub,” located a few miles from the final destination. At the transfer hub, a local driver takes control of the freight and manually drives it to the end location. When this model is operating seamlessly, the long haul and local drivers will essentially switch loads, with the long haul driver shipping the goods picked up by the local driver to a distant transfer hub. Uber anticipates that “every self-driving truck will need partners to cover local routes and bring loads to and from [last-mile] hubs.” Given changing demographics and these shifting economic currents, America will need many more last-mile drivers, and teams to support them, in the coming years. However we approach this issue, one takeaway is clear: self-driving technology is great for White Glove deliveries, and great for the people working in the White Glove delivery industry. It will reduce the cost of shipping, increasing the demand for heavy goods and triggering a redistribution of logistics employment from the first-mile to the last-mile. And as of today, there is no scalable substitution for human delivery teams in performing White Glove deliveries. There is not even one on the horizon. White Glove deliveries as we know them will be a reality for the foreseeable future. All of this means that the White Glove delivery operations of the future will need technology that is equipped to meet rising demand and automation in other areas of the supply chain, and that perfectly complements the delivery teams that will continue to deliver goods to customers’ homes. Deliveright offers this solution. Our technology integrates with many other technological platforms and automates as much as it can, while remaining flexible enough to adapt to the needs of the people running the operation on the ground. We are prepared for the future, and if you run your operation on our software, you will be too. The first quarter of 2018 has been an exciting time for Deliveright. As the spring 2018 High Point Market approaches, we want to share some of the ways that we are making life easier for our customers. In late 2017, Deliveright started making final-mile deliveries out of Lexington, NC, whereas we previously serviced NC out of GA. Now you can have items delivered to NC customers much more quickly. You can now send even more CA and FL deliveries our way. As of the Fall 2017 HP Market, we had just expanded our coverage to CA and FL. We are happy to report that both volume and capacity in these states have grown rapidly. You can also now deliver to customers in certain high-population areas of AZ and NV, including Phoenix, Tucson, and Las Vegas. Let us brave the desert heat to make deliveries for you this summer. Take a look at our coverage map to see our current coverage area. If you would like to meet us in High Point, please send a preferred date and time to meet@deliveright.com. We would love to learn about your needs and to help save you time, money and aggravation. It’s what we do! We look forward to continuing our work together. If you need anything, use our contact page to send an email or give us a call at (862) 279-7332. We are eager to hear from you. COIs: Many NYC apartment buildings require a Certificate of Insurance from any company delivering (or moving) large goods. Our software helps to automate the process of working with customers well ahead of time to prepare necessary documents. Building Restrictions: Along with requiring COIs, many apartment buildings only allow delivery of large goods during certain time windows. Any delivery operation running in NYC must be flexible enough to adjust to time limitations imposed by buildings. Elevators and Space: Most New Yorkers have a story that goes something like this: you’ve ordered a large piece of furniture, have watched the delivery team lug the item up six flights of stairs because it wouldn’t fit in your building’s elevator, and after all that, the piece is rejected because it couldn’t fit through the door to your apartment. Delivery teams operating in NYC should be gifted in spatial relations, and well-trained in performing difficult deliveries with high potential for damage. Traffic: The bane of every New York drivers’ existence… traffic can throw a wrench into even the best-designed NYC routes. It is essential to account for traffic when building NYC routes by adding in extra time to each stop, along with using navigation software to help drive teams avoid traffic. Tolls: Trucks that travel over bridges, through tunnels, and between boroughs pay expensive tolls. These costs need to be built into the delivery company’s pricing models. Parking / third person: Deliveries to NYC require a third person on the team to stay with the truck, while the other two team members perform the delivery. This is necessary because convenient parking spaces for trucks are few and far between in the city. As with tolls, this adds to the cost of NYC deliveries. Our software is designed to solve these problems. If you would like us to leverage our New York expertise to perform a delivery to the five boroughs for you, or anywhere else we cover, just book an order or contact our sales team to find out more. If you want to find out more about our software, contact our technology sales team for a demonstration. We want to share exactly what differentiates Deliveright’s delivery platform from the pack. The key difference is that our platform is designed primarily for E-commerce businesses which focus on selling large, heavy goods, and need a white glove solution to ensure proper handling of their products. Today’s E-commerce customers expect an end-to-end online experience. They want to find the product, buy it, pay for it, and wait for it to arrive, all without talking to a person or wasting hours exchanging emails. We aimed to provide exactly this experience when we designed our delivery platform, Grasshopper. Online booking, tracking, scheduling, and most importantly, real-time electronic proof of delivery, are all built into the platform. This accelerates and streamlines the delivery process so that your customer will receive their goods quicker and with less headaches. Grasshopper’s functionalities are all available on demand (and in real-time) through our RESTful 2.0 API. Our API comes with extensive documentation and a dedicated integration team, both of which will ensure a smooth and quick integration with your platform. We are already integrated with dozens of delivery partners, who as a result have seen their teams spend more time on growing their businesses and less on the day-to-day managing of orders. We also use Webhooks, which enable your system to receive instant updates from our platform for any event that happens on an order. We took the same approach to our internal operations as we did to our technology – we built it all! All our locations are 100% mobile-driven: no papers or clipboards. Our team can perform all tasks through our warehouse management apps, from receiving, loading, relocating and identifying orders, to simple scanning or searching for orders. The warehouse technology package is complete with wireless and Bluetooth connectivity to mobile printers, for quick and easy printing of shipping labels right on the spot. Along with an industry-leading technology and operational platform, we have built the perfect customer success team to work with your customers and address issues right as they happen. We understand that Deliveright is a crucial part of our E-commerce customers’ online reputation, as we are typically the only link in the chain that has any face-to-face interaction with the customer. We work closely with our partners’ customer service teams to handle special situations when they happen. In addition, we have deployed a proactive approach by texting customers after every delivery to check on their experience. If we hear anything that is less than perfect, our customer success team will engage to learn more. We understand what it takes to make your customer and your operating team happy in today’s online shopping environment. Contact our sales and technology team to learn more about how Deliveright can help your business run better. Why Is White Glove Delivery of Furniture So Difficult to Arrange? If you think about this question, you are likely working with the wrong process and the wrong partner. For years, excellence in White Glove delivery purely came down to service. However, with the advent of technology and increasing numbers of customers shopping online, technology has become a crucial part of the White Glove experience. Imagine ordering small items from Amazon and not getting a tracking link. Today this is unthinkable. However, in the furniture delivery world, this is still the standard. Deliveright’s technology is built to handle this function and many more. By empowering our customers with the most advanced technology in the industry, we reduce the amount of effort websites, designers, vendors and end consumers have to invest in logistics and delivery. Using the best technology makes it easier to provide the best service. 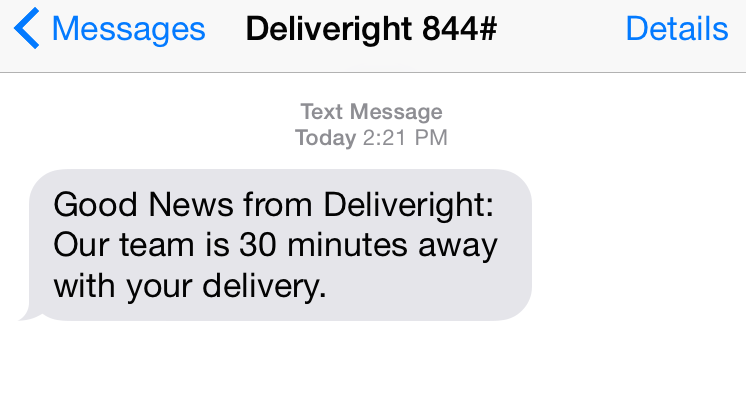 Try Deliveright and see how easy it can be to have furniture delivered! In part 2 of our series on delivery partners who have adopted our technology and processes, we will focus on K&K Transfer, a South Florida-based last mile White Glove delivery company. K&K, headquartered in Pompano Beach, FL, provides excellent logistics services to a wide range of customers. Celebrating 31 years in business, K&K offers local and long distance delivery and warehousing and storage for furniture companies and designers. As is the case with all partners in the Deliveright network, K&K provides white glove service, treats all items with exquisite care, and inspects (and repairs) all pieces passing through its facility. And of course, every step of the process is managed and reported by Deliveright’s Grasshopper technology. K&K built its reputation working with designers and knows how to offer the ideal customer experience. In addition, by focusing on operations and efficiency, K&K can also work with Deliveright’s high volume, E-commerce accounts. Whether you are a delivery company that wants to take your operation to the next level, like K&K, or an E-commerce retailer that needs help with logistics and/or deliveries, contact us today to see our technology in action! In the coming weeks, we will be taking a look at some of our network partners – the White Glove delivery companies who run on Deliveright’s last-mile White Glove delivery technology and as a result, have seen their businesses grow and improve. First up is B Cubed Shipping, a family-owned delivery business operating throughout the West Coast. B Cubed has three distribution centers, strategically located in large population centers that allow it to service California, Arizona, and Nevada effectively. B Cubed delivers furniture for a diverse portfolio of clients, ranging from luxury online retailers, like One Kings Lane, to well-known manufacturers, like Virginia House, along with many interior decorators and designers. Since integrating its operations with Deliveright’s platform, Grasshopper, B Cubed’s volume has grown, both because it has gained access to new customers through the Deliveright Network and because it can take advantage of the efficiencies offered by running on Grasshopper. If you have a delivery company and want to take your operation to the next level, like B Cubed has done, contact us today to see our technology in action! Here at Deliveright, we are ringing in 2018 with a brand new website that offers as smooth an experience on the web as our operations do in the home. If you’re just getting started with Deliveright, please read about our background, the services we offer, the solutions we tailor to our many customers, and the technology that sets us apart from every other White Glove delivery company. Need a quote? Use our instant quote tool. Want to check on an order? Use our real-time tracking technology. Want to open an account? It’s easy to sign up and get started with Grasshopper, our industry-leading White Glove delivery platform. Sign up today! We will be updating this blog regularly with information about our business and the delivery industry in general, along with tips and tricks on transporting, repairing, and maintaining furniture. It’s what we do best. And if you have any questions to ask, please do, we’re happy to help. So stay tuned and check back regularly! As a delivery company, you know that as you grow your delivery volume, every delivery needs to be optimized for perfection. Given that, it’s important to build the right system and employ the right set of tools that will help you manage your delivery routes, taking into consideration all the factors that make the difference between a successful and a failed routing strategy. In this series on route optimization, we will list these factors and explain how we approached them at Deliveright to optimize our routing, improving the chance that every delivery will make it to its destination on the first try while managing our costs and efficiencies. Customers – They can (and will) change their delivery preferences during and after the routing process, sometimes even while the truck is on its way to their home. Weather – Rain, snow, even just fog could throw off all delivery time estimates. Traffic – While sometimes traffic can be anticipated, there are situations where it cannot be, for example in the event of accidents. Unexpected complicated delivery – Unforeseen complications can always come up once at the customer’s home. For example, upon reaching the customer’s home you could realize that the furniture pieces don’t fit in the elevator, and your team must carry it all the way up to the 10th floor via the staircase. These are just a sample of factors, but you get the gist – there are some factors that you can’t really plan for. These will cause great frustration for you and for the customers who are waiting for their deliveries. Even if everything goes perfectly, your costs still must be managed and your trucks still must be run efficiently. Your routes and schedule must make sense time-wise and distance-wise. Taking all of this into account is hard, complicated and frustrating if you don’t have the right tools. But wait, there is some hope, and a solution! At Deliveright, we have spent a great amount of effort to figure out how can we leverage our data analytics platform, Gloverix™, to plan, and sometimes eliminate, situations like the ones listed above, while making sure that our trucks are routed to perfection and that our delivery teams can meet their daily goals. Weight / mile ratio – When you load your truck, one of the ratios that you need to pay attention to is the Weight-to-mile ratio, or how many miles a truck is driving at a given weight. Your goal is to make this ratio as big as possible in order to optimize fuel efficiency. At the same time, you don’t want your truck to sit in traffic all day or be overly packed with merchandise because you stretch your limits on this, so make sure you trade-off wisely. Volume per truck – An empty truck is a losing truck. You always want to maximize the volume that you load on each truck. However, you can’t wait until you get a completely full truck to make your deliveries. Your customers would be upset and your entire operation would be a mess due to the random delivery schedule. At Deliveright, we developed and adopted several distribution models that allow us to determine how many trucks we should allocate for each route (daily or weekly), factoring seasonality and other effects on demand into the models. Our models run automatically and rebalance our trucks’ distribution as we see (or foresee) changes coming. The predictability enables retailers to adapt to our delivery network and use us for some of their deliveries while still running their own trucks. Fight the traffic – At Deliveright, we have experimented with different technologies and approaches on how to optimize our routes to avoid traffic. We realized that for traffic, crowed-sourced decision-making is always better than relying on one software to call the shots. Hence, we embedded Waze routing optimization into our delivery teams mobile app and the results are just amazing! We have seen a meaningful increase in our delivery teams making it to their stop before or at the scheduled arrival time, and have been able to reduce our delivery window down to 3 hours. We are working to narrow it even further! Be fluid – Deliveright’s routing algorithm has another neat feature: it can react to changes occurring after the truck has left the hub, and adjust the delivery team’s schedule while they are on their way. For example, there are instances where a customer calls us on the day of the delivery to inform us that they won’t be at home during their delivery window. In the old days, the drive team would have take the piece back to the warehouse at the end of the day and you would have to reschedule with the customer, sacrificing revenue and time. However, we realized that making a delivery on the same day is always more cost-efficient than sending it again, and also reduces the change of damage to the furniture piece by saving it from another trip. In a case like this, our Routing Intelligence, GIT (Get It Today), will take the customer’s preferences (for example, a later time on the same day) and will re-route the delivery team’s route and push an updated route to the delivery team’s mobile app. The delivery team does not need to do anything, as the route changes automatically. The satisfaction that the customer has once they see that they can still get their delivery despite the last minute change – priceless! This was part I of optimizing your routes. Part II is coming shortly. Fall 2017 HP Market and Much More! We are excited about the upcoming HP Market and hope to see many of you there. Here are some exciting developments to make life easier for you. We are proud to announce that Deliveright now provides service to California and Florida. 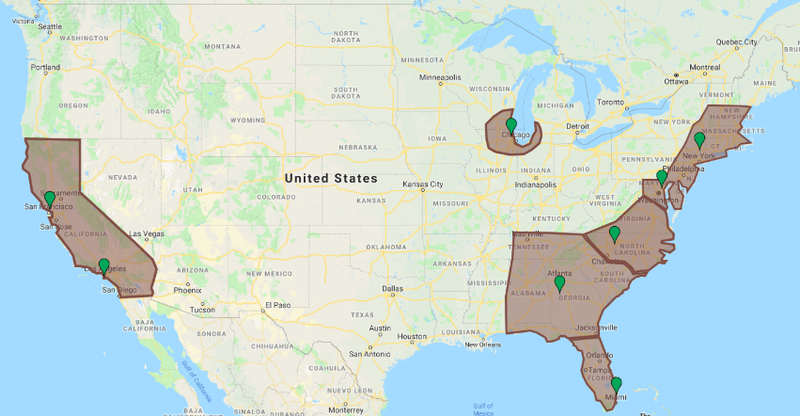 We can manage your freight originating in NC, CA and other parts of the country through final mile delivery to these states. Coming soon, we will expand our White Glove delivery service throughout all of North Carolina. How do you get started? Simply book a delivery through our platform, Grasshopper, and let us do the rest. For more information contact us at info@deliveright.com. Want to get information about your order or get a quote without using a phone/tablet/laptop? We have just integrated our platform with the Amazon Echo, which means that Alexa can track your order, provide you with scheduling availability and soon you will be able to quote and schedule through our Alexa app. Much more fun to come! In addition to our in-house Alexa skill, we will soon release a customer version. Please send us your suggestions for how you would like to use the Alexa skill to make your life (and your team’s) easier. Submit ideas to echo@deliveright.com. The more people use Grasshopper, the more we hear how powerful it is. We love getting suggestions about what you would like to do with it next. Please send ideas to feedback@deliveright.com. If you would like to meet in High Point, please send a preferred date and time to meet@deliveright.com. We would love to learn about your needs and to help save you time, money and aggravation. It’s what we do! We look forward to continuing our work together this fall. If you need anything, email us at info@deliveright.comor give us a call at 1-862-279-7332. We are eager to hear from you! At Deliveright we leverage the power of cutting edge technologies to manage our cloud-based White Glove delivery service. Our approach allows us to manage our entire delivery network — in real time! Route Optimization – This is a critical component of White Glove delivery and benefits greatly from technology. Technology helps determine how to reach destinations efficiently and on time, minimizing miles driven, avoiding traffic (in real time), reducing weight/distance ratio (how many miles a truck drives with a given weight), and incorporates many other optimization factors. Technology can help you get more deliveries made, on time! Allocating your truck correctly (and safely) – What is the right way to allocate truck space with respect to its scheduled stops? Where do you place each item, and how do you place them in a way which avoids damage? We are solving all of these questions using our proprietary TuckTheTruck™ technology, that enables our delivery teams to load their daily deliveries in the most efficient way (and unload them later), and also helps them place items correctly to reduce the risk of damage during the trip. In addition, our TuckTheTruck™ technology continues to evolve and adapt to different truck sizes and supports different delivery needs (for example, 5 floor walk-ups with a Buffet!). Damage Pre-emption (1) – Damage can happen anywhere during the trip from the manufacturer to the customer’s home. Using our mobile technology, we help our delivery teams load fragile items correctly onto the truck to minimize the risk of damage during the trip from point A to point B. Damage Pre-emption (2) – Our DentScanner™ technology helps us identify fragile items and notify our manufacturer partners when our system discovers higher-than-usual damage rates. We help manufacturers focus on the specific items that need upgraded packaging to promote safer, more successful deliveries – a win-win for everyone! Instant Feedback – To ensure our customers receive top quality service from our delivery teams, at the end of each delivery we communicate electronically (SMS / Email) with the customer to get feedback about their delivery experience. This survey helps us to evaluate our delivery teams and improve their skills for the next deliveries. Go Paperless – Today’s home deliveries involve paper, in fact, too much paper! At Deliveright we eliminate any trace of paper from our delivery process. All our deliveries are signed electronically (on our mobile App), and all delivery confirmations, damage reports, rejects, etc. are reported electronically to each party with photos. This saves everyone money, time and makes it easier to retain records. The entire process is a breeze. As we enter a new season and the Spring 2017 HP MKT approaches, we are happy to bring some fresh and exciting news from the Deliveright “Bakery”. We are happy to announce that as of April 1st we also offer MS pickups (not blanket wrapped) for delivery to any of the regions that we serve. The order booking process remains the same, just select MS as the origin! Have multiple vendors in an order and need a different BOL for each vendor? No problem. The new BOL download process will prompt you to select for which vendor you would like to get a BOL and create one customized for you. Need to change the customer information or add a note on the order, you can now do it in 2 seconds. Click on the action column on the Orders dashboard and click Cancel. With HP MKT starting soon, we look forward to visiting with existing partners and meeting new ones as well. If you would like to meet in High Point, please send us a message (meet@deliveright.com) and we’ll arrange a time. We would be happy to learn about your needs and see how we might be able to save you time, money and aggravation. It’s what we do! We have also enabled a quick and easy way to communicate with our Customer Success Team, by phone or email. Download the Deliveright App at the App Store or Google Play. Try it out, we would love to get your feedback on how we can make it even better! We can now pick up from many vendors throughout California and deliver to the East Coast. Just like any pickup on the East Coast, we will arrange the freight & the last mile for you, and it’s all done in the same simple way on Grasshopper. While making the user-friendly mobile App, we also upgraded the web version with better and quicker order booking. Now you can book pickups from multiple vendors on the same order, automatically email BOLs / Labels directly to vendors, preview orders and much more. With HPMKT fast approaching, we look forward to visiting our existing partners and seeing new ones as well. If you would like to meet in High Point, please send us a message (meet@deliveright.com) and we’ll arrange a time. We would be happy to learn about your needs and see how we might be able to save you time, money and aggravation. It’s what we do! Text messages, multiple confirmations and meet us at High-point Market! This week we are super-psyched to roll out an exciting upgrade to our platform. The best part is that it’s all about you, our customer, and we think you’re just gonna love it! At Deliveright we are all-in when it comes to fast communication with our customers, and for today’s consumers, FAST means text messaging. 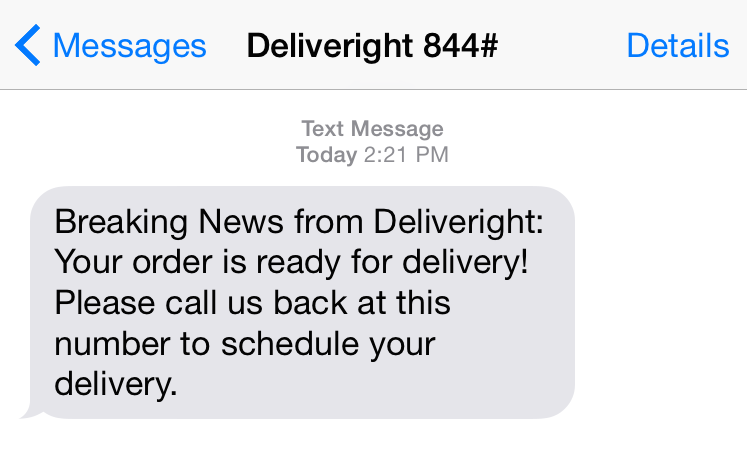 For our delivery partners that want to know when a delivery is made, now you can get a delivery confirmation through text-message too!! You can request multiple recipients for your Order and Delivery Confirmations, so you can keep your entire organization in the loop. But it’s even better! You can mix & match between email and text messages (or both) so some recipients receive emails (with pictures and detailed information) and some receive a simple text. It’s up to you! We will be visiting the HP market and would be thrilled to meet you. Email us with a preferred date/time (Sun-Tues) at meet [at] deliveright.com and we will set it up.